Patrick House of Vicksburg, Mississippi, became Season 10 winner of The Biggest Loser in 2010 and has stayed healthy ever since. This past April, he ran in his fifth Boston Marathon. Reflecting on the past six years, I can clearly see that my Biggest Loser experience not only saved my life, it opened doors for me to inspire others and reach personal goals that I may never have reached without it. When I had my one-on-one talk with Dr. H on the show in 2010, he told me that I was five years away from a major heart catastrophe. He said my poor eating habits and sedentary lifestyle were literally killing me. I had high blood pressure, high cholesterol, obstructive sleep apnea, diabetes, and the veins and arteries of a 60-year-old man. I was just 28 years old at the time. Then in walked The Biggest Loser, Bob Harper, and Jillian Michaels, and my life was changed forever. Bob and Jillian are two amazing people who save other people’s lives. I was one of the fortunate ones chosen for Biggest Loser Season 10, and I had the opportunity to be trained by them and to learn from them. I wanted to soak up all that I could and bring that knowledge back to my home state of Mississippi, which, at that time, had been the most obese state in the nation for seven years running. I knew we needed the help. I was bound and determined to present Mississippi in a positive light and to use what I learned to help my fellow Mississippians. And I did just that. After winning The Biggest Loser, I returned to Mississippi and spent three solid years traveling across the state and country, making appearances and giving motivational speeches to share my story and to help others achieve a healthy lifestyle. I got such an amazing sense of gratification from speaking at each business, organization, association, school, church, and convention, knowing that they were listening and soaking in everything that I was sharing with them…just the way I had soaked it all in from Bob, Jillian, and the medical staff on The Biggest Loser. It was always awesome to see the light bulb finally go off in someone’s head when they realized that they are worth making the changes and sacrifices needed to live a healthy lifestyle. Anyone can do it….it just takes total commitment and buy-in from within yourself. While on the Biggest Loser ranch, I learned how to eat healthier, how to exercise more efficiently, and how to implement all of those things into living my new healthy and active lifestyle. Bob and Jillian pushed us to our max, but I learned a lot about myself and a lot about how to remain healthy. It was so much more than just a TV show or just cutting calories in an attempt to win. It was about making a long-standing lifestyle change and working to help others implement that same mentality. Part of my journey included keeping a daily journal of what exercises we did with Bob and Jillian, what food I ate, challenges we undertook, weigh-ins we had, eliminations that took place, and basically everything that I experienced on a day-to-day basis. Little did I know, but upon returning home, that journal would transform into my book As Big as a House (see footer for more information), which I use today to further share the story of my journey: From growing up in Mississippi to promoting health and wellness all over the country. It contains all the exercise secrets that Bob and Jillian taught us, my favorite tried-and-true Biggest Loser recipes for weight loss, and my personal tips and tricks for achieving the hardest part of weight loss…keeping it off! For me, keeping it off has included staying active and challenging myself as a runner. One thing that I have done every single year since winning Biggest Loser is run the Boston Marathon as a registered charity runner through the American Liver Foundation. Every April since 2011, I have lined up in Hopkinton, Massachusetts, and run the 26.2 miles back to Boston to the finish line on Boylston Street. What an amazing experience it is! An estimated one million spectators line the course and cheer you on as you make your way through the towns and toward your finish line on Boylston. It has been such an awesome experience for me and something that I look forward to each and every year. 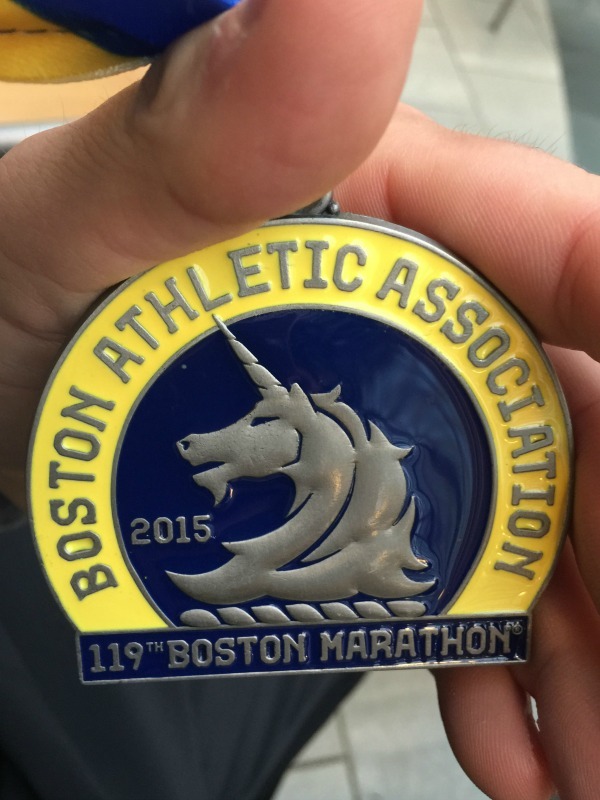 Patrick’s Boston Marathon medal from this past April. On April 20 of this year, I completed my fifth consecutive Boston Marathon, in some of the toughest conditions I have ever raced in. Temps were in the low 40s; a steady and drenching rain poured; and headwinds ranged from 20 to 30 miles per hour through the entire race. It was tough, but I finished and got my fifth medal! The tragedy of the 2013 Boston Marathon is a day I will never forget. I went into the event after enduring 20 weeks of training and strict diet regulations to prepare for attempting to set my best marathon time. After calculating my training runs and reviewing my performance level, I set my goal time for 4 hours and 10 minutes. When I got to Boston and met with my American Liver Foundation running team, I came across a couple of people I had met in 2012 and remembered a promise I had made to them that, if they were to run the 2013 race, I would keep pace with them and help push them to their first Boston Marathon finish. They seemed thrilled to see me and excited about having me push them along the course. I knew I would need to slow my pace for them, but I kept my word. It’s funny how things happen. Little did I know, but keeping my word may have saved my life. The video of the 2013 finish line shows the running clock display a time of 4:09:58 when the first bomb went off. I was running with my Liver Foundation teammates at mile 24.5 at 4:09:58…just under my 4:10:00 goal. Had I been running on my own, attempting to set my new personal best time, I could have been right there at the finish line in the thick of all the tragedy. Pretty eye-opening and a solid reminder that everything happens for a reason. Through all of these amazing experiences—reclaiming my health, winning The Biggest Loser, meeting and helping so many wonderful people across the country, and running in five Boston Marathons—I have learned that anyone can make lifesaving changes to live a healthier lifestyle. Change is all about making up your mind, deciding to live your life a different way, and sticking to it daily. Something magical happens when you set goals and take small steps each and every day toward achieving those goals…one day you get there! So, whether your journey is losing weight or running a marathon, you can only begin by taking a first step toward a healthy lifestyle. I personally challenge each and every person to join me in that lifestyle. Take your first step and feel the benefits of being a healthy and active person. Patrick House is the Season 10 winner of NBC’s The Biggest Loser. He is available for speaking engagements, appearances, book signings, and boot camps. For inquiries about appearances or to purchase an autographed copy of his book for $20 (shipping included), e-mail Patrickhouse62282@yahoo.com. You can also follow him on Facebook.